You would have to be totally disinterested to fail to note that something is very wrong with the Christian Church today. Good is often called evil and evil good. The devout are mocked and the unrepentant and proud praised. This time has been foreseen by many Saints and of course Our Blessed Lord Himself when He asked if there would be any faith remaining at the time of His return. “Ape-Church” or “nuChurch” co-exists with the same buildings and administrative structure as True Church. The enemy (the devil) has been temporarily successful at keeping those who hold fast to the Old Faith (Scripture & 20 Doctrinal Councils) scattered. There are many good and holy clergy and laity in the “mainstream” Church or other traditions preserving valid apostolic succession and our intent is not to insult or detract from them. There is only One Catholic Church. One Faith, One Lord and One baptism. them across time and space to visit a typical Western Catholic parish they would be hard pressed to see it as Christian in many cases, let alone Catholic. 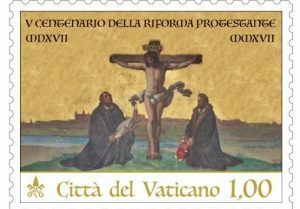 The image to the left is a recent Vatican stamp replacing Our Blessed Mother and St John with Luther and a minion. If you do not see anything wrong with this- please go in peace. I can offer little for you here. The two major earthly sources of attack of nuChurch against Church are Freemasonry and Communism. Whether we are dealing with people or ideas formally attached to a lodge or political party is irrelevant. The ideas behind these things have percolated into the Roman Catholic Church over the past 100+ years. The goal is to change the focus from God to man. To forsake and scorn Divine Providence and attempt to build a human utopia in contradiction to Our Lord. A rude gesture to the profound gift and reality of the Incarnation: Word made flesh. We’ve mentioned the two main philosophical sources and now pay attention to their targets. The two main targets are the Holy Mass and marriage & the family. You don’t have to be a theologian to see this. -Our Lady of Good Success, 1610 A.D. These things are unfolding as we speak. As many “mainline” Catholics are replacing the Faith of their ancestors with variants of Marxism making “‘progress’ of man” their god and “social justice” their sacrament. Under the guise of the corporal works of mercy they have created for themselves a nuReligion devoid of the transcendent and in mockery of the First Commandment. Hold true to Sacred Scripture, the Councils, the old Catechisms and the Faith of the Saints, if anything opposes this, even if it be a bishop or pope, it is not of God. (Fulton J. Sheen, Communism and the Conscience of the West [Bobbs-Merril Company, Indianapolis, 1948], pp. 24-25) Quote excerpts obtained from this excellent site.